Betty Boo A.K.A Betty Winston who along with her late sister Jackie, and fellow sisters Diane and Pat Lewis recorded three 45 singles for the legendary Detroit Golden World label during 1964 and 1965 under the group name of The Adorables. With their final Golden World release “Ooh Boy/Devil In His Eyes” (GW-25) becoming a hugely collectable dance floor favourite in more recent times. record as solo artists and as part of Isaac Hayes Hot Buttered Soul project. As for Betty she would go on to record several, at the time unissued songs with Richard ‘Popcorn’ Wylie (the producer on “Ooh Boy”). These unissued masters would remain in the can until their eventual discovery during the mid 1970’s by Soul Bowl’s John Anderson. Therefore, through a subsequent licensing deal followed by extensive airplay via advance acetates given to the influential DJ’s of the time Richard Searling, Ian Clark and Poke amongst others. Two of Betty’s songs would become dance floor favourites within the Northern Soul scene. Firstly the track entitled “Spellbound” which only appeared on the first Grapevine album ‘Talk Of The Grapevine’ amongst a host of other excellent previously unissued Popcorn masters, released during 1978. Followed a year later by the perennial favourite “Say It Isn’t So” which gained a release on a highly collectable Grapevine 45 as well as featuring on the second Grapevine album, ‘The Sound Of The Grapevine’. 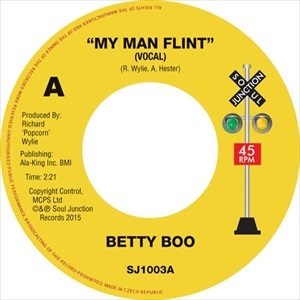 So fast forward to 2016, and a third unissued Betty Boo track “My Man Flint” will be gaining a belated release. “My Man Flint” is Betty’s contribution to the media’s 1960’s cold war influenced obsession with espionage. The British had James Bond, The Russians a whole bunch of former 1930’s Cambridge graduates and the Americans one Derek Flint. Master spy Derek Flint (played by Actor James Coburn) featured in two spoof spy films, “Our Man Flint” (1965) followed by “In Like Flint” (1967) as a suave, undisciplined philandering secret agent (much to the annoyance of his boss Lloyd Cramden, played by Lee J. Cobb) who invariably saved the western world from being held to ransom by some evil clandestine organisation. One can only assume that Wylie and Hester wrote and produced this track in the hope that it would be used as part of a future film score? But what seems to have turned out to be the big screen’s loss will now become the Northern Soul scenes gain. Soul Junction’s release of “My Man Flint” features both the vocal and instrumental version. With the instrumental version albeit as a shorter cut being previously issued on the aforementioned Sound Of The Grapevine album under the fictitious artist and title of The Motor City Shakers, “Let’s Do The Duck”.